This Anti Bullying Week, Seahorses Mini Rugby Choose Respect. #ANTIBULLYINGWEEK. The theme for this year's Anti-Bullying Week is to 'Choose Respect', over bullying. Following a consultation with over 800 children, teachers and members of the Anti-Bullying Alliance, it emerged that a top priority was showing that bullying is a behaviour choice, and that children and young people can set a positive example by opting to respect each other at school, in their homes and communities, sports and online. 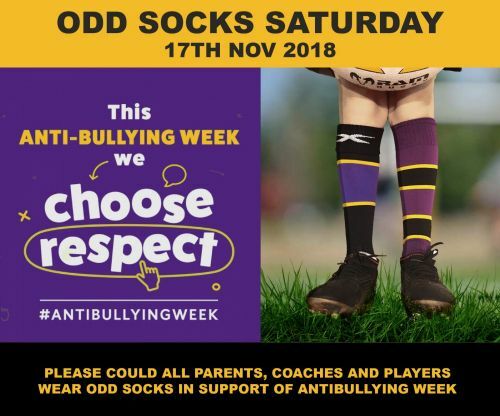 The aim of this week is to create awareness by wearing odd socks, to show that Instonians Seahorses choose respect over rugby.